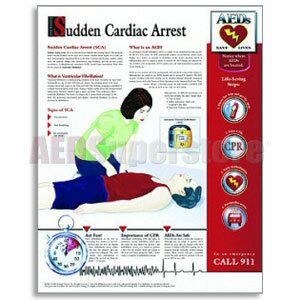 Sudden Cardiac Arrest poster with detailed illustrations and simple to understand commands. Understanding Sudden Cardiac Arrest teaches what is SCA, how does it affect your heart and what to do in an emergency situation. All you need to know to act quickly. Designed by experts in medical education, We like the easy-to-understand content. 11" x 17" poster uses 12pt font, 14" x 20" poster is in 14pt font, 18" x 24" poster has 11pt font for the paragraphs and up to 24pt for the subtitles.